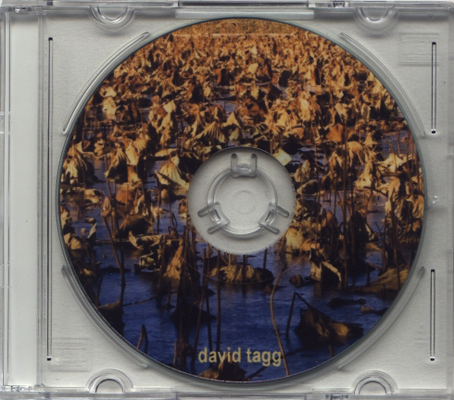 “Return of the light” and – “The embracer” are two guitar tracks by David Tagg, who manipulates this instrument in order to create deep, lengthy drones. The soft, textured droplets of sound gather, with time, to form intense, focused plateaus of powerful, yet smooth music. “Return of the light” takes the time to grow into full momentum, at which point it blows into an occult sounding underground choir, artificially created by guitar strings and electronic pedals. This slow singing of long metallic spirals that vibrates through Tagg’s guitar is a crushing experience, haunting with its impact and surprising with it’s simplicity. As the title suggest, this track might sound dark, but Tagg is promising light with the tiny musical developments that circle the main body of sound. On “The embracer” Tagg lets the sounds vibrate more in a low rumble, convincing the listeners to witness the full power of his abilities flowing gently beneath their feet like a huge Shai Hulud, shifting beneath their reach. As minutes pass, Tagg develops more sounds until “The Embracer” gains the shape of a feedback tidal wave. Tagg’s ability to slowly shift and turn his creation, changing it dramatically over the time, yet in such a smooth way that these changes can even be missed by ears that are not 100% dedicated, makes this small album a well worthy one, and a decent part of Ta’alem’s ever growing discography.